Sweet Cheeks Adventures: Dora and Friends: Season 1 on DVD! Dora and Friends: Season 1 on DVD! Dora and Friends are out on DVD!! When we got the chance to have the complete first season on DVD, Ally ripped the package out of my hands and demanded to watch it immediately. Who knew she was still such a big fan of Dora? I realized that since Dora grew up right along with her, that is what has kept her interest. Smart thinking, Nickelodeon! With over seven hours of entertainment, this educational DVD collection features "Dragon In the School," a never before-aired episode of Dora and Friends as well as a Nick Jr. Bonus Disc! Fans won't want to miss this 4-disc collection, complete with doggie adoptions, Puppy Princesses, beautiful mermaids and so much more! 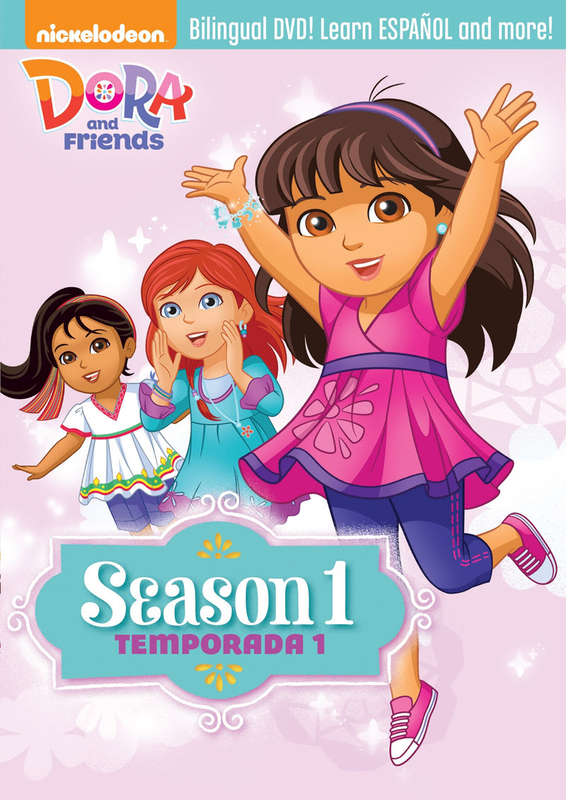 Created by Nickelodeon and distributed by Paramount Home Media Distribution, Dora and Friends: The Complete First Seasonarrives on DVD on December 8, 2015 for the suggested retail price of $21.99. Ally's favorite part about the new disks is she could choose to watch them in English or Spanish. She is hoping to be fluent in Spanish some day, so this is a great starts for my little 6 year old! Want a chance to bring this DVD into your home this Holiday Season? Enter the giveaway below! Good Luck!! Dates: Starts December 8, 2015 5:00 pm EST. Winner will be chosen December 21, 2015 11:59 pm EST. Looks like something Lucy will love! I would give this to my granddaughter. She loves Dora. My daughter, she loves the show and we always miss it when it's on. Thanks for the chance! My daughter would like it, we love that it would teach her a few words in Spanish! i would gift this to my niece who loves Dora! This will definitely help her keep her spanish in check! My 7 year old daughter Kenyah who is a Dora fanatic!! If I win, this would be for my daughters. They absolutely love Dora. I would share this with my daughters who both love Dora and they will watch it with their two male cousins who come over all the time and also love Dora! My grandaughter loves Dora would love to win this. My kids would, they like boots.